You are currently browsing the tag archive for the ‘aeropuerto’ tag. 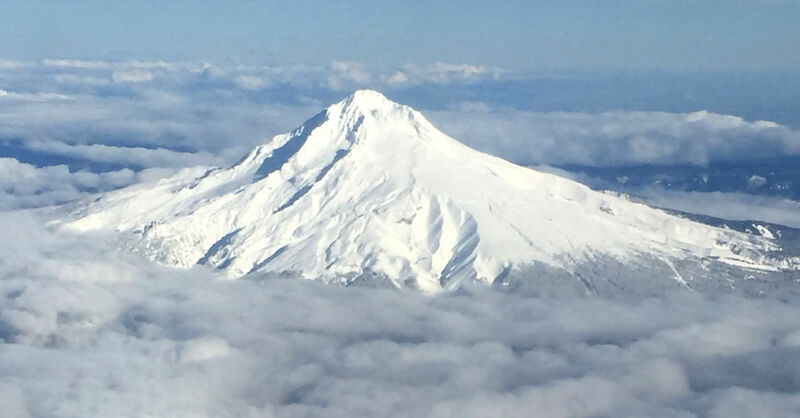 My favourite volcano of them all was back home in Oregon. Here, Mt. Hood rises from the clouds as we approach Portland. Margaret and I got up early with intent to blast out of the Barn and Puerto Varas by 7am. Vicki had insisted she would be up to wave goodbye, and sure enough she greeted me on my last scramble down the stairs. Hugs and kisses (Chileans kiss once, on the right cheek) and I found Margaret waiting in the rental car with the motor already running. It had been a stressful night for her. For some unexplained reason, her phone access to Internet had stopped working. This was bad news for a person who was planning to be in South America for another month. She has an Android, and I don’t know how those work, so I was no help at all. Everything looked fine. It just wasn’t connecting to the Internet. So, while there was the initial stress of trying to get M to the bus on time (the next bus would leave 12 hours later, so we really had to make the right bus), there was the pervasive stress of how to communicate during the remainder of the trip. We had poured over maps the night before, and also asked directions of Vicki, because in Chile our phone GPS was not working. Roads looked easy to identify on the map, and intersections looked distinct. As we zoomed through the countryside past a little green sign with a “590” and an arrow, a quiet voice in me said that was our road. Bless Margaret for being able to have faith in her navigator. She was already turning around by the time I located the road directions I had jotted down and confirmed that 590 was the road I wanted. The way we remembered directions was different, and this time we were in such a hurry that it made us doubt ourselves. But viola! Out we popped right at the aeropuerto. 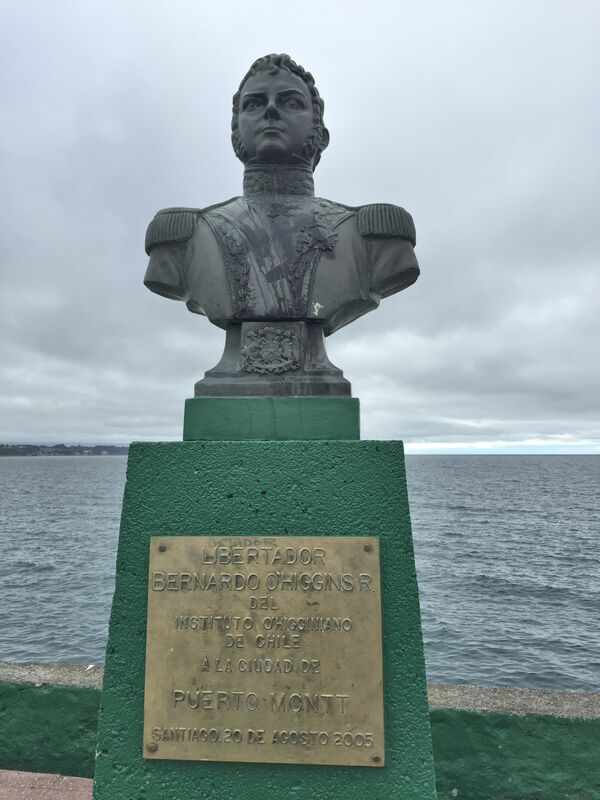 Bust of O’Higgins: the most popular and wholly unexpected name we saw during our trip in Chile. A Toyota auto parts store made me think of my brother, who visited me in Japan, mostly to see the cars. 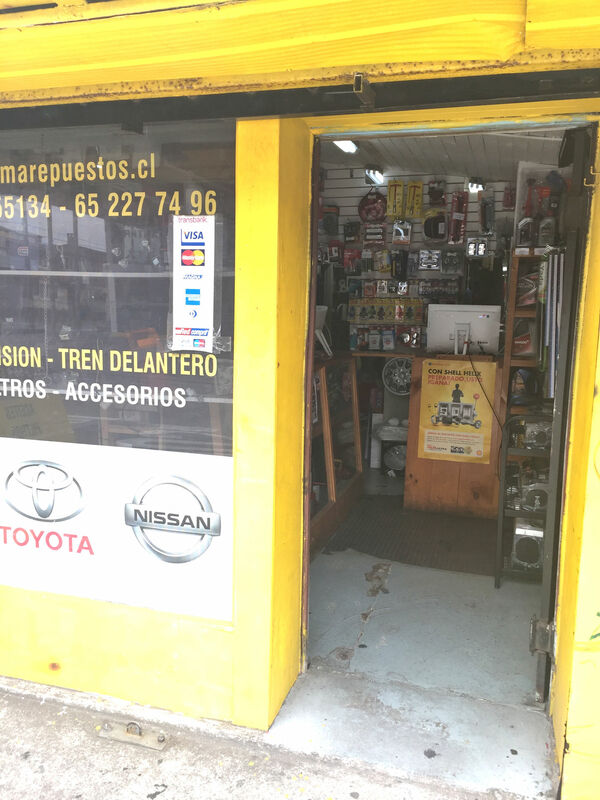 We dropped the keys at the car rental counter at 7:30am, this time more used to the circadian rhythms of Chileans, so we didn’t expect that a car rental employee would even show up for two more hours. We then looked for a taxi, and realized…it’s 7:30 am in Chile. There are no taxis, even at the airport. I went to check my bag at the LATAM counter while Margaret summoned a taxi. My plan was to go play in Puerto Montt until my flight left, 7 hours later. By the time I got my boarding passes, Margaret and the driver were waiting for me. 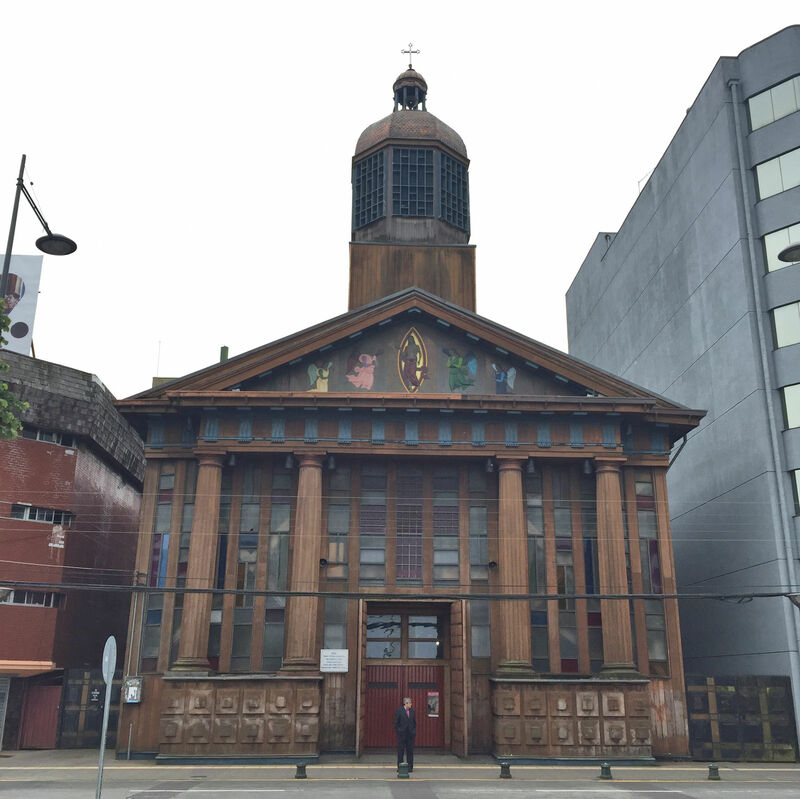 A wooden church in Puerto Montt. 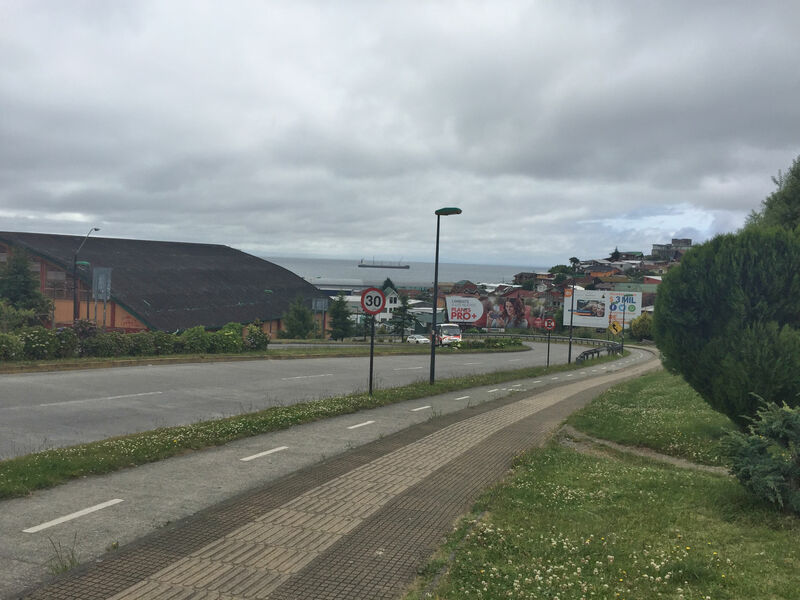 The empty morning streets of Puerto Montt. A home I would readily expect to find in Portland. While M frantically tried to ask the woman to place a call for a taxi for us (the woman had to ask a co-worker for a number, and the first number didn’t work, and…), I glanced outside and saw a miracle: a lone taxi was pulling up to the tour building. I went outside, armed with the proper words this time “estación de bus municipal?” Si, he answered, and I grabbed M and jumped in. She managed to express that we were in a hurry, and the sweet man understood immediately and got us to the right bus station pronto. M checked in and had her ticket confirmed and we were pointed to the right bus. We went outside of the (disheveled, loud, busy, confusing…i.e. a proper) bus station, found the driver of our bus and loaded M’s bag. Success! With 14 minutes to spare. 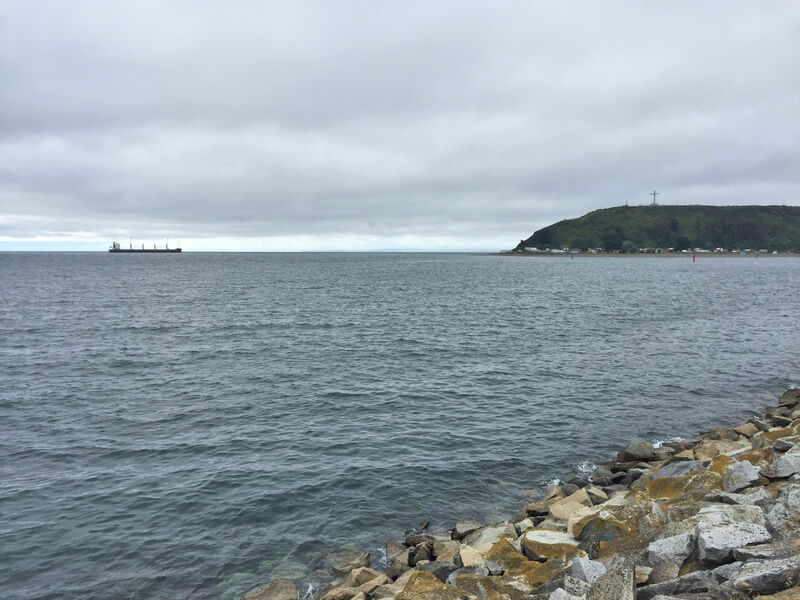 The view of the sea from the municipal bus station in Puerto Montt. “Should we just wait here?” I asked her. “No, I saw a phone store,” she answered, heading back into the building. Get a load of that woman! In all the craziness, of taxis and hauling our bags and running through the madness of the municipal bus station, Margaret had another part of her brain still working on the broken phone problem. We found the phone store, and an employee that spoke English! (angels singing) He poked around with the phone for 5 minutes and said, “It’s fine. There’s no problem.” M tried a few things, sent and received some email, and confirmed that her phone was indeed working perfectly. We don’t know if the man fixed it, or if it fixed itself, but it didn’t matter. We shared hugs and kisses and many thanks to each other for the companionship of the past 10 days, and M boarded the bus and off she went. 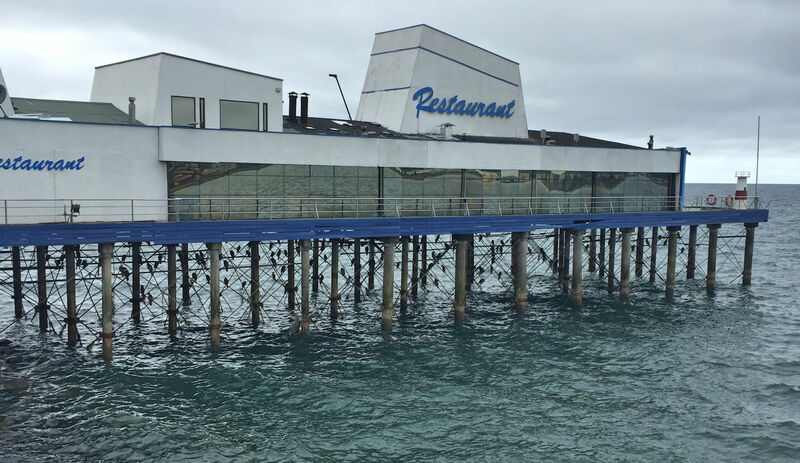 Birds roost on the pilings beneath a restaurant on the water. Looking downhill to the sea. Nope, nothing interesting up here either. But check out the bike-and-pedestrian friendly paths. The municipal bus station in Puerto Montt is in the city, and not in some remote warehouse industrial area, like the tourist office. It’s right on the shores of a bay in the Pacific Ocean, so my hopes were high for a lovely diversion until it was time to go back to the airport. Instead, the skies were grey, and it was cold and windy. So cold my fingers were frozen. 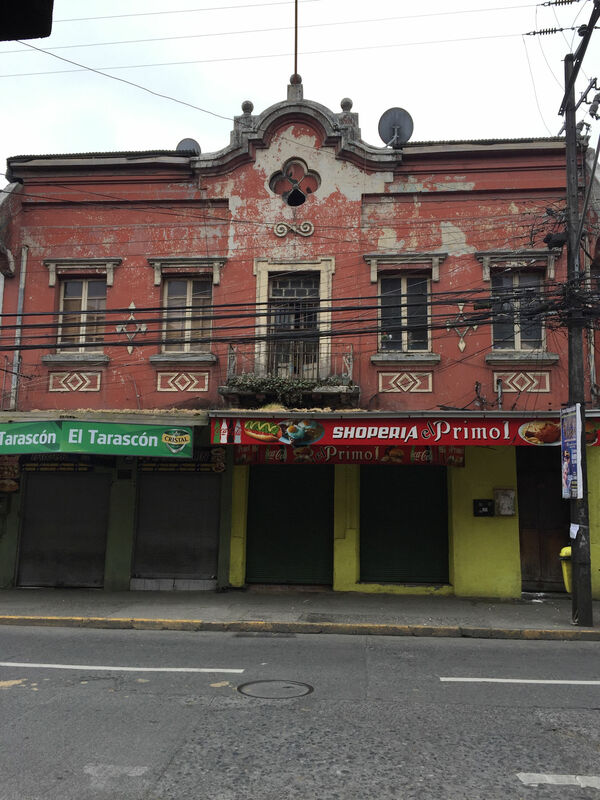 I walked up and down the streets briskly – partly to try and get warm, partly to look for something interesting – and found very little that captured my attention compared to the wonderful places I have been in Chile. I had to keep my head bowed to avoid the blasts of wind, even along the backstreets away from the waterfront. I did take photos on my phone (the broken camera was packed in my luggage), and those are what you see in this post. 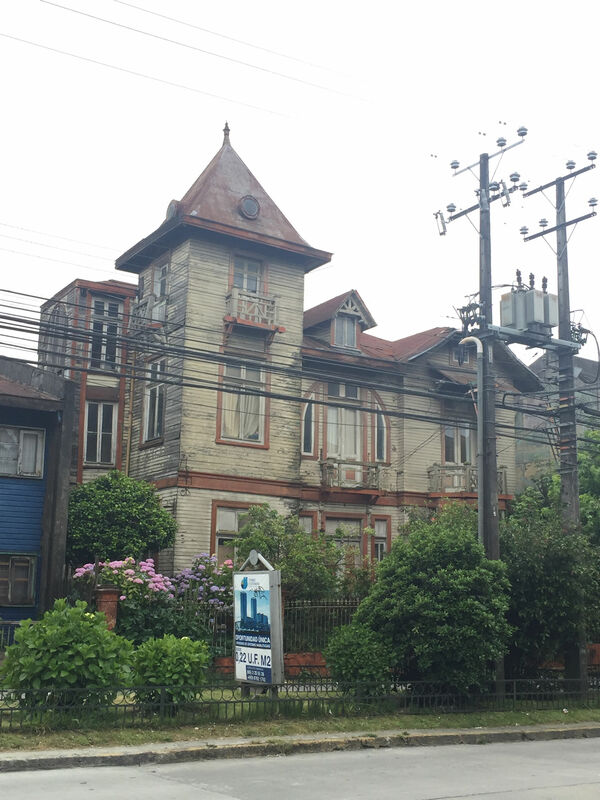 Tip for travelers: spend as little time as possible in Puerto Montt. 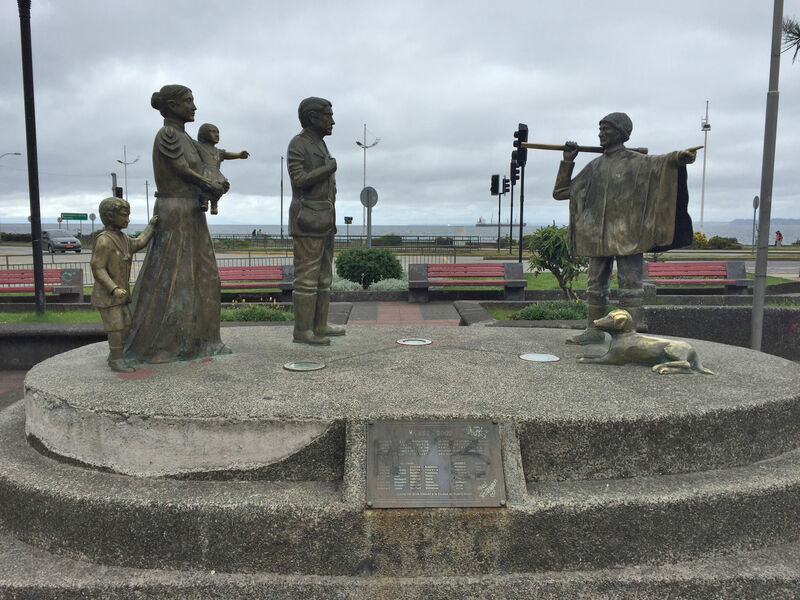 A memorial in Puerto Montt recognizing the German families welcomed to settle by the Chileans in this area. I see two interesting things: the dog is obviously patted more than any other part of it, and the height of the people is proportionate: Margaret and I have found ourselves distinctly taller than most of the people here. It was still too early in the morning for commerce or activity, but I chanced upon a bakery with the lights on, and bought the best cheese empanada outside of the fish market in Santiago. It was warm and flaky and perfect, and gone too fast. I threw in the towel, went back to the bus station, and bought a ticket back to the airport. 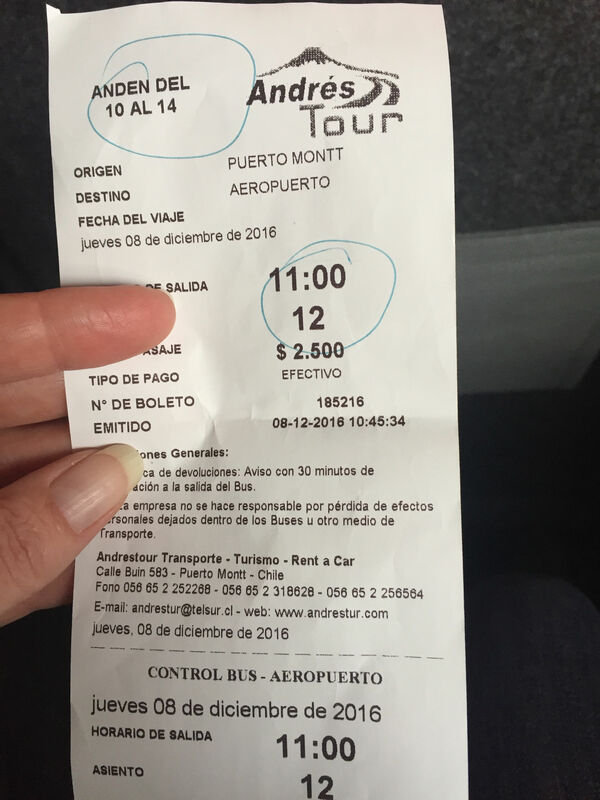 I paid $23 to get onto an earlier flight to Santiago. In two hours, I was sweating in Santiago. What a difference! I found the same bus Margaret and I used on November 30th, paid for a ticket, and hopped on. We had been on the red line subway so many times, I was pretty sure I would remember the name of the stop. I watched out the windows, and easily got off at the right place, where the bus station is co-located with the metro. I went underground, bought a subway pass (using up handfuls of 10 peso coins, in an effort to get rid of them), and popped up above ground again in downtown Santiago at the stop for Universidad Católica. I was warm and knew my way around. It had been the correct decision to leave Puerto Montt. A week earlier I had left my book at Angelo’s place, and used that as an excuse to come back into town on my long layover. I arrived at the apartment building and was buzzed through the gate into the reception area on the ground floor. Though Margaret and I had seen the same attendant every single time we passed through the foyer, for three days straight, wouldn’t you know it that a totally new person would be there this time, ensuring that her building was safe. I had such a poor grasp of Spanish I knew there was no possible way for me to explain the situation. This does not come up in English-Spanish phrase books: Hi, I’m an American, yes, but I do know Angelo and Evelyn on the 22nd floor, and they know me. I’m here to pick up my book, that I left here last week. I’ll be gone soon and I do not pose a threat to the tenants. I opted for confidence. I waved “Hola!” at the desk attendant and headed for the elevators. The woman asked me something I didn’t understand, and even stood up behind the counter, trying to get me to come back and engage. “Ventidós,” Twenty-two, I said with a comfortable smile, and pointed at the elevator, “Es bueno.” She said something else to me, and again I pretended all was well. The elevator opened and I stepped on, punched a button and waved at her, saying once more, “Es bueno!” I watched out for security in the halls when I stepped out, but apparently my ploy had worked and there were no carabineros waiting there to take me down. Evelyn let me into the apartment with a gracious smile and hugs and kisses and she made me feel genuinely welcomed. Oh how I wish I had this skill of grace and hospitality that comes naturally to some nations. She asked me to sit down and poured me a drink of water right away because I was parched. Imagine that, after a morning of frozen, shaking fingers numbly pawing at an empanada to get at its warmth. I offered to leave a couple times, but Evelyn seemed confused, and again I admired her hospitality. In the US, so many of us would be eager to extricate ourselves from a meeting with an AirBnb client who spoke another language and only stopped by to get her book. I know that some of us are able to genuinely put strangers at ease, but many of us would be looking forward to the end of it. What a lovely lovely human being she is. I stayed for an hour. Neither of us speaking the other’s language, but knowing a few words and supplementing with pantomime. I pulled up photos of Tara to show off, and she showed me her sister and parents. Evelyn pulled up a translator app and we were able to ask each other more complicated questions. I asked if there were tensions with Indigenous people, as there are in the US. She said yes, especially in the south (as I had noticed) “they fight for their land.” Wow. It really is the same story all over the world. I thought it would be a good time to talk about the recent success of the Standing Rock Sioux tribe – with the help of so many other Nations – in preventing the oil pipeline crossing their land. But that was too many words, and I kept it to myself. One of my many tickets to get somewhere today. Right below the apartment is a supermarket, and I went in for some miel (honey). I had counted and recounted my pesos, and had enough to get gifts for someone back home. In the store I found a jar of the exact same miel I had tried on the day of the rafting trip! I was very excited and spent all my surplus pesos to get it. Thus, I could not do any more shopping. I walked across the street to the base of Castillo Hidalgo (mentioned in a previous post, and one of my favourite places in Santiago already). The park is landscaped with both grass for lounging, and with flowers and bushes to appease my love of plants. The stone walls and arches are pleasing, there is lots of shade, and benches. Though an afternoon on a Thursday, there were many people in the park, skateboarding through, smoking on the grass, napping, talking and laughing. I stripped off my outer layers of clothing (it was so warm! ), and laid on the grass with my head on my backpack for an hour and a half reading my newly-retrieved book, and most of the people there when I arrived were still there when I left. It was a comforting and happy atmosphere. Many uncomfortable hours in a coach seat in a couple of airplanes later, I emerged from my vacation world to a startlingly snowy Portland.